We work to help everyone walk and bike around Austin safely, comfortably and conveniently as they travel to work, school, run errands, exercise and have fun. Our street design projects improve city streets to better serve people of all ages and abilities as they drive, walk, bike and take transit. 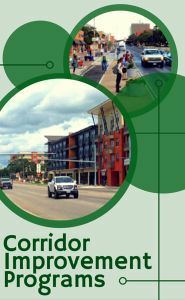 The Arterial Management Division of the Austin Transportation Department works to manage mobility and safety for all modes of travel on Austin’s arterial roadways. Arterials are roadways that are intended to carry higher amounts of traffic at a higher speed than neighborhood streets. The goal of the City of Austin Parking Enterprise Division is to make parking convenient and user-friendly throughout the City. The right of way (ROW) is the area owned and/or controlled by the City and typically includes the street surface, sidewalks, and grassy areas between pavement and property lines. The boundaries of the ROW will vary depending on the physical conditions at any given location. Click here to view an image of the ROW. The Signs & Markings division is responsible for installation and maintenance of signs and street markings for the public in order to provide for the purpose of guiding, warning, or regulatory traffic by providing safe and efficient movement of goods and services.